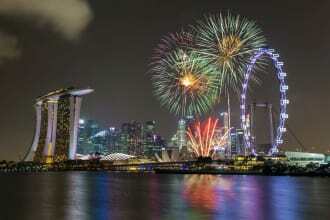 For couples in love & in search for a Romantic Vacation, amidst all the glitter, Singapore is the place to be. Singapore has a plethora of activities for newly married couple to engage in. A Romantic & exciting time awaits you. Explore the Beaches of Singapore, a bit of peace & serenity in this otherwise Happening City! Looking for an All Inclusive Package? Check this section out for the best deals with flights. For the ones who want to experience Singapore in-and-out , some Thrill, some peace, and a lot of bonding. If its the best deals that you are looking for, then this shelf will help you in choosing the holiday of your liking. 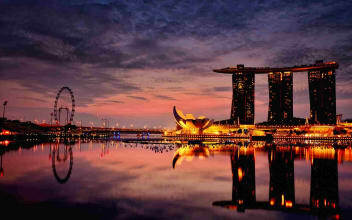 Bond with your family over a visit to Singapore, and explore the City & the various Theme Parks. Are there any language barriers in Singapore? Singaporeans are multi-cultural, as people from countries like China, Malaysia, India & Indonesia comprise the majority of the population. Almost everyone can converse in English with people also speaking Mandarin, Tamil & Malay. Is Vegetarian / Jain food available in Singapore? The local Singaporean population comprises of many Indians as well, which means that there are a lot of options available for Vegetarians, even the pure ones. But as a back-up, do inform your Tour operator about your meal preference, at the time of booking the package. The best months for a Singapore Holiday are from February to April; May & June are the hottest months , whereas November to February are the wettest months. How shall we pack for a Singapore Trip? The Weather in Singapore stays mildly warm throughout the year. Carrying T-shirts, shorts, jeans, light jackets, etc. should suffice for the holiday duration. How many days would be required for covering Singapore completely? The ideal duration for a Singapore holiday is between 6 to 7 Days, as you will be able to cover most parts of the city within this time, including the major attractions & Theme Parks. 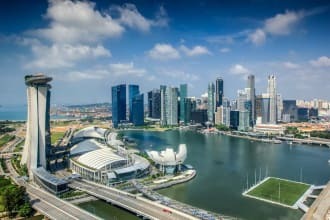 What is the best way to travel around Singapore? Singapore is known Worldwide for its perfectly organised public transportation systems. The connectivity is great, and quite economical at the same time. Taking a local taxi can be quite expensive, and not recommended either. What type of food is available in SIngapore? The food in Singapore takes influence from Malaysia, China, India & Indonesia. The main diet comprises of Rice, Noodles & Seafood. 1.) Chilli Crab - A dish with hard shelled crabs cooked in semi-liquid tomato chilli gravy. Ironically, this dish is not as spicy as it sounds. 2.) Char Kuay Teow - A thick noodle dish, with fish cake, clams, sausage, bean sprouts and black soya sauce. 3.) Barbequed Stingray - Stingray meat covered in Sambal Sauce (Spicy sauce with chilies, diced tomatoes and shrimp paste). This is a very famous street food found in Hawker Stalls across the city. 4.) Fish Head Curry - Originating from the South Indian streets, this dish also has a Chinese & Malay influence. It is typically a fish head cooked in a curry with vegetables, and served with bread or rice. 5.) Laksa - It is a rice noodle dish, that takes influence from Chinese & Malay cuisine. It has rice noodles in a spicy curry soup with shrimp, chicken, egg & fish cakes. 1.) Roti Prata - A light & fluffy puff pastry that is flipped & tossed on a pan till crispy golden brown. 2.) Mee Goreng / Nasi Goreng - Rice or Noodleds stir fried with vegetables, onions, garlic, chillies, tomatoes, and sometimes egg or tofu. This dish was introduced by Chinese immigrants, with an Indian & Malay influence. 3.) Chinese Rojak - A Malaysian Term - Rojak, means a varied mix of just about anything edible. Chinese Rojak is a fruit salad banana flower, pineapple, turnip, bean sprouts, cucumber, mango, fried bean curd, chilli, lime juice, sugar & tamarind, topped with roasted peanuts. 4.) Gado Gado - An Indonesian style salad, made with tofu, cucumbers, blanched green vegetables, rice cakes & bean sprouts tossed in a spicy peanut sauce & tapioca crackers. 5.) Goreng Pisang - Hot crisp fried banana fritters, consumed as a snack. At some places it is served with Vanilla Ice cream or chocolate sauce. What kind of a weather awaits us in Singapore? Singapore has a Tropical climate & the weather in Singapore is considerably warm throughout the year. December is the time when it rains, and February happens to be the hottest month usually. This Zoo is known as the World's best zoo and is home to Orangutans, Chimpanzees, Komodo Dragons, Kangaroos, Meerkats, Zebras & White Tigers. 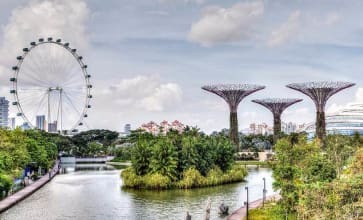 Adjacent to the main reservoir, Gardens by the Bay is a nature reserve, that looks like a futuristic park and covers over a 100 hectares of reclaimed land in Central Singapore. This park comprises of three waterfront gardens - Bay Central Garden, Bay East Garden & Bay South Garden. The Singapore Night Safari is part of the Wildlife Reserve, and is the first nocturnal zoo in the World, that houses animals normally active during the night. 38% of the species present here are under the threat of extinction. The night safari is an open-air zoo only open at night that has a Tropical Humid Climate, and is a very good place to spot Asian Elephants, Indian Rhinoceros, Leopards & Tigers. With the World's largest flying aviaries, this Bird Sanctuary is quite famous for spotting the Caribbean Flamingos. It was created with an idea that the locals could escape from the city life and have a relaxing time. 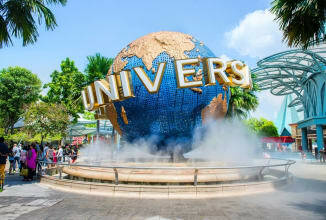 The Universal Studios is a Theme Park located on the Sentosa Island. The Park boasts of over 24 rides, and 7 Themed Zones - Hollywood, New York, The Lost World, Madagascar, Ancient Egypt & Sci-fy City. Visiting this Park is a must for every traveler in Singapore, as it is the only kind in Asia. The Marine Life Park, also located on the Sentosa Island covering around 8 hectares, and houses two attractions - Adventure Cove Water park & the S.E.A. World. The S.E.A. Aquarium has more than a 100,000 animals of around 800 species. The Adventure Cove Water park features 7 water slides, one of the longest lazy rivers in the World. The Merlion Park located near the Central Business District, is a Singapore landmark and a major tourist attraction. The Merlion is a mythical creature with the head of a Lion and the body of a fish. There are 2 Merlion Statues standing at this place, where the taller one is 8.6 metres tall. The Marina Bay is located in the Central Area of Singapore, that divides the region into 4 parts - Marina East, Marina South, Downtown, & Straits View. One should also be excited to know that the Famous Singapore Formuala 1 Track is located around this Bay. The Singapore Flyer is the World's largest Ferris Wheel. The View from atop this Observation Wheel is spectacular with the City skyline in clear visibility, and the Indonesian Spice Islands & Malaysia's Strait of Johor also visible on clear days. The Botanic Gardens comprise an eco-garden, eco-lake, sculptures, bonsai gardens and many other gardens and beautiful sights. The Garden preserves Singapore's heritage trees that one can encounter during a walk along the trails.